Museo mundial – Land grabbing - who owns the land? 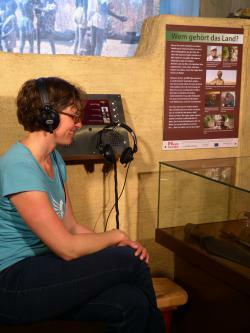 The new audio point in the Nuremberg Natural History Museum explores the topic of land grabbing and the people affected by its consequences. Land grabbing is a new phenomenon that means large-scale acquisitions of farmland by foreign investors in another country (mainly in the Southern Hemisphere) in order to produce staple foods that will usually be exported to the investor's home country. The audio point is integrated into a model of a West African home. It tells the story of a sugar project in Mali from the perspectives of various people involved in it. You can sit down and listen to the plans of the manager who wants to involve agricultural labourers by offering them jobs. On the other hand, you can also listen to a land rights activist and some farmers from the village that are against the project. Finally, the visitor can also obtain some general information on land grabbing. Sit down and relax while finding out about the problems connected to foreign direct investment in land. Get to know a real life case study from Mali and listen to the different perspectives of the people involved on the ground. Form his/her own opinion about the various aspects of this issue and its social, political and economic consequences. Get to know the viewpoints of agricultural labourers and how these contrast with the statements made by the investors that are the dominant actors in this process. This tool sheds light mainly on Millennium Development Goal (MDG) 1 ("Eradicate extreme poverty and hunger"); MDG 7 ("Ensure environmental sustainability") and MDG 8 ("Develop a global partnership for development"). The agribusiness owner believes that his business is beneficial to everyone and that people will earn more through it: Click here to listen. A farmer welcomes the project as he hopes it will increase his income. Click here to listen. Another farmer opposes the agribusiness project because he feels that his land is being stolen from him. Click here to listen. Women from a village in the area covered by the project accuse the project owners of chopping down trees that form an essential part of their daily diets. Click here to listen. A national politician says that most of the land being cultivated by the agribusiness is unused and, therefore, it is not harming small-scale farmers. Click here to listen. A farmers association activist claims that government policy is violating the right to food. Click here to listen. In addition, there is an introduction (click here to listen), as well as background information (click here to listen). We chose to connect the topic of land grabbing to a replica of a traditional West African home that is displayed in the Nuremberg Natural History Museum. Of course, an installation on land grabbing could be connected to many other objects and issues, such as objects demonstrating traditional ways of life, case studies on agriculture, objects used for agriculture, agricultural products, and installations about subsistence economies and self-sufficient agriculture. → Focus on a key story. As the problem of land grabbing is a huge and complex topic in which the visitor can easily get lost, we recommend concentrating on a certain aspect of it, such as the consequences for the local community, peasants’ movements and their claims, the effects on local and national economies, the historical process of land grabbing, international legal developments, and the effects on biodiversity and food security. 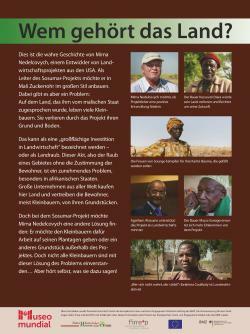 In our case, we focused on telling the story of one specific project in Mali and presented the different perspectives of the people involved, since they are quite representative of the different viewpoints on land grabbing at a global level. → We used an audio point to present the topic as space is very limited in this particular part of the museum. But, in general, visual media like touchscreens displaying images of land grabbing or other forms of presentation are, of course, equally suitable. 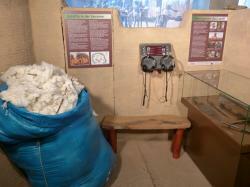 The audio installation in this example was installed inside a Western African home. When adding an installation to an existing display, as we did, it is useful to design a first visual draft of the idea, bringing together your ideas with those of your partners. This helps all partners to discuss in more detail where and how to install the additional elements. For example, in our case it helped us to decide in advance whether to create a standalone audio point or to put a bench next to the audio point to make listening a more comfortable experience for the visitors. Ask for quotes at every stage of the production process. Try to get several quotes for each stage, so that you will be able to select the best one. Add up all the quotes and compare this total to your budget plan and then adjust the budget as necessary. → In our case, there was a huge difference between audio points that replay the same audio track on a loop and those audio points that allow visitors to choose different audio tracks. We chose the second option, but if you want to reduce your costs significantly you could opt for an audio point with only one track. Of course, any kind of content on land grabbing could be added to an audio point. However, the unique added value that an audio point offers is that it can reproduce the original words of those people that are directly affected by land grabbing. Thus, you can capture eyewitness reports. Therefore, we chose to present six first-hand statements from supporters and opponents of an agricultural project. But how can first-hand quotes be obtained from people in developing countries? Possible facilitators are migrant organizations that can contact people interested in sharing their story in an interview. In addition, existing media productions on the topic of land grabbing can be adapted and incorporated into an audio point. We used a film on land grabbing as the basis for our audio point tracks. The film is called "Land Rush" (www.whypoverty.net/video/land-rush). This film presents interviews with farmers, politicians and agribusiness entrepreneurs. We asked for permission to use the interviews free of charge on our audio point, and the film producers agreed. We then translated parts of the interviews into German and chose key quotes that reflected the main arguments for and against land grabbing on a global level. Overloading the listener with information generally means that he/she will remember less content. Consequently, you might want to keep the audio content brief. For our land grabbing installation, we limited the time of each track to between two and three minutes. Before producing audio tracks of the texts that you have translated, it is useful to ask partners or colleagues for feedback. We found that our own perception of the short audio text was very different from that of people without any background knowledge on land grabbing. Therefore, feedback from these people was especially valuable, and we adapted the texts accordingly. Producing an audio track from a text is something that is best done by a professional dubber. The more persons there are to be dubbed, the more expensive the production will become. This is something that you might want to take into consideration when putting together the texts. In our case, we had six different source persons speaking which increased the price of the audio installation considerably. Correction loops: Several correction cycles are needed for the audio tracks with the audio dubber. Once the audio tracks are finally approved, the audio production company will send you the tracks as digital files (for example mp3). Different audio points need different audio formats. So make sure you get the files from the audio production company in the appropriate format for the audio point. Once the final audio tracks are ready, the production of the audio point can start. At the same time, you can finalize any "extras", such as an information panel, as required. The final audio point must be transported to the museum. Normally the audio point production company will take care of this. Before finally installing the audio station, its functionality should be checked by those persons who developed the audio track contents to ensure that everything is working as planned. Audio points are ideal for controversial topics like land grabbing. Two or more different opinions can be presented in a much more lively way than through using written texts. 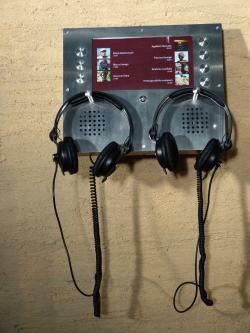 Audio points can provide a large amount of information while only occupying a small amount of space in the museum. Therefore, they are useful if you want to introduce development topics into exhibitions with limited space. Audio points are not immediately eye catching. If you want your development information to grab the visitor’s attention immediately, you will need additional material such as information panels, signs and so on, which will cost extra. An audio point with two outputs is more versatile in the way it can be used. One output should be for headphones and the other one should be for speakers. The first one is for individual visitors and the latter can be used for guided tours. Visitors will only access an audio point for a short period of time unless they are given the chance to sit down. Therefore, it is advisable to provide chairs or benches nearby. Visitors gave us positive feedback on the multi-perspective approach provided by the audio point, in presenting different opinions on the topic of land grabbing and letting visitors make up their own minds.